From the small town of Agios Nikolaos,Crete it takes about one hour to reach by boat, Spinalonga Island . However as our friend Margaret had only a few days left of her holiday with us, we decided to take the shorter run from the small village of Plaka where we had to wait for a smaller boat. Spinalonga is a “Must visit” for most of our friends and relatives since Victoria Hislops book called The Island, a fiction based on fact story about Spinalonga. 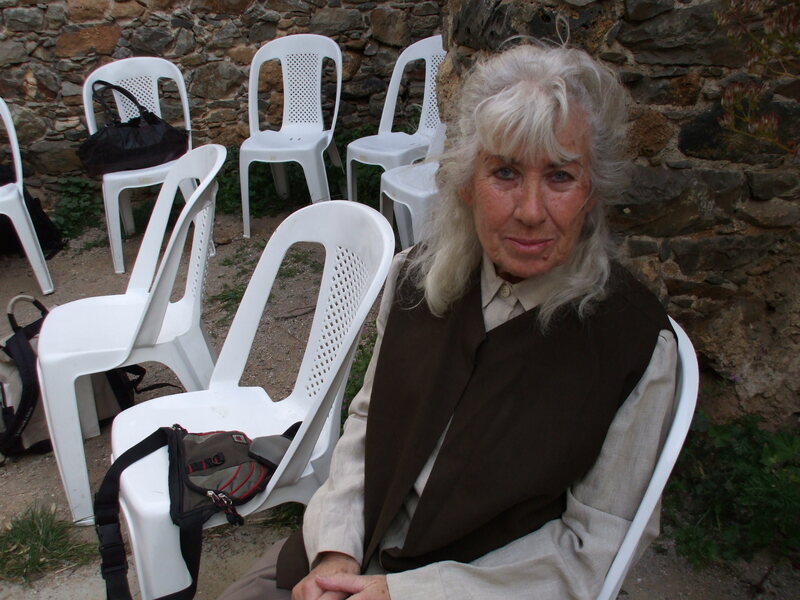 The Television Series taken from the book is a huge success here in Crete in which I and my partner John were lucky enough to be chosen as extra’s playing the part of two lepers. There are twenty six episode’s and we spent many hours being made up to look as lepers. This experience made us realise what these poor people endured during their short lives. Unfortunately the day we decided to take our friend to Spinalonga the weather changed completely,heavy clouds and thunderstorms took over and by this time we were already on the boat. I explained to Margaret that the islands fortifications had been built by the Venetians in 1579. 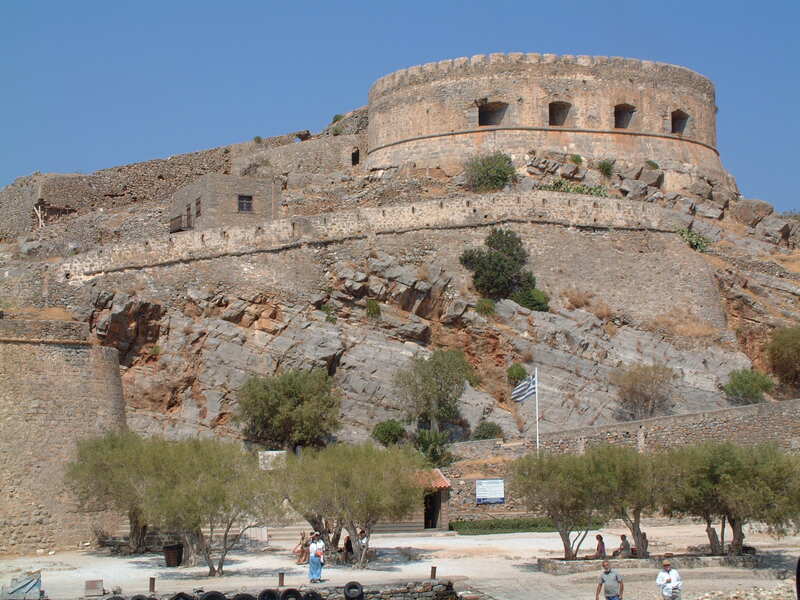 Then Spinalonga entered its darkest days as it was chosen by the Government as a leper colony.These poor people were taken across to Spinalonga and housed in the crumbling old buildings of the Turkish town and left to fend for themselves. 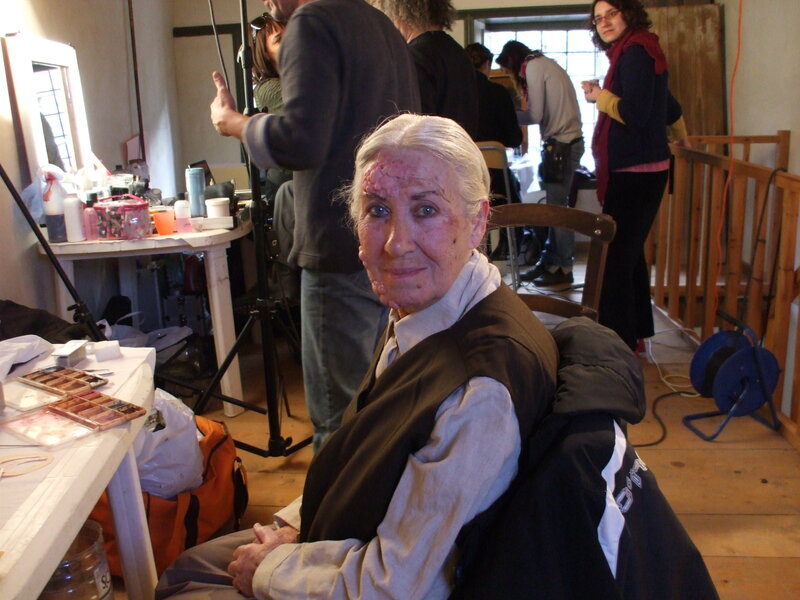 You could read my book ” TOFFEE APPLES & TOGAS” for the rest of the story regarding Spinalonga but carry on to see photo’s of me made up as a leper for the T.V. Series. Click on pictures to see larger version. The day after our trip to Spinalonga it was time for both Margaret and myself to celebrate our birthdays as we both share the same date. Of course we are spoilt for choice as the Creten countryside is spectacular with its magnificent mountain ranges and villages to explore. 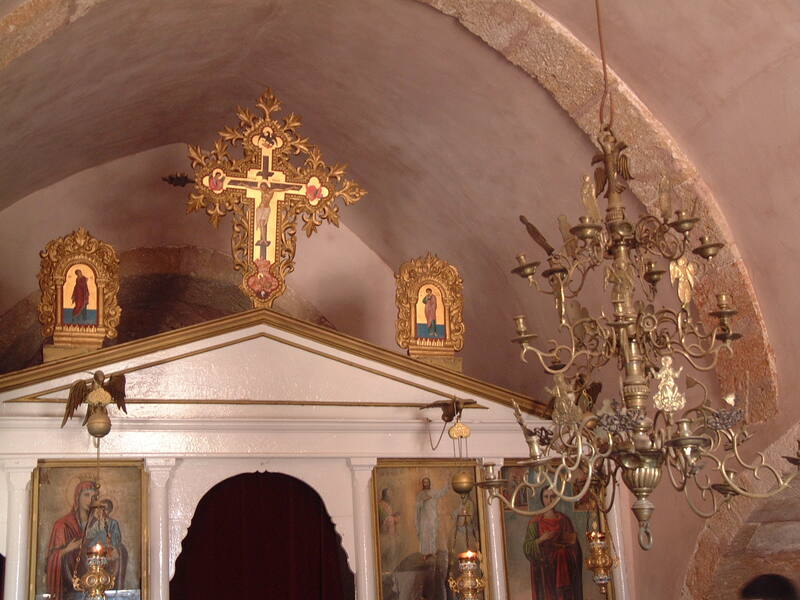 So we decided to do just that, and drove towards the pretty little town of Kritsa where we remembered the small three sided Byzantine church called ” Panaghia Kera ” which has some beautiful paintings around all the walls and ceilings. We then treated ourselves to some of the beautiful tablecloths embroidered with colourful byzantine designs, then made our way home taking the longer route round so as to enjoy more of the scenery. The evening of our birthdays could not come quick enough as John had planned a surpise outing to a beautiful traditional Greek Restaurant. Which, although the journey entailed an hours drive away to the town called Hersonessos is one of the best places to eat. We duly arrived at Galeni’s Restaurant where we were warmly welcomed and directed to out table. Our friend Margaret could not believe her eyes at seeing such an usual setting. The waitresses were dressed in the ancient Cretan style and the waiters in the usual whiter than white shirts and black trousers while the service was impeccable. The place was crowded so of course once everyone knew of our birthdays sang Happy Birthday, and we were both presented with a surprise present, a lovely bracelet each as a gift from the Restaurant Manager. So, Margaret and I enjoyed our birthdays together which is something we have been meaning to do for some years. Role on next year and maybe we will celebrate again.